Gymnasts Thomas Wilson, Taio Welch, Liam Standeven, Max Gardner, Jacob Marsh, Hayden Taylor-Walton, Christian Mobsby and Luke Marsh from Rugby Gymnastics Club Men’s Artistic Squad qualified to compete for West Midlands at the Men’s Artistic National Elite and Development Grade Finals held at the GMAC in Birmingham last weekend (November 9-11). The boys competed across a number of age categories in both team and individual competitions with tremendous performances from them all. The Elite Level 5 (under 13s) team including Rugby gymnast Luke Marsh took second place and in the individual all-round Elite Level 5 competition Luke also won the all-round gold medal. All of the gymnasts train between 20 and 30 hours per week with their coaches Sergiy Kotlyarov and Julie Marsh at Rugby Gymnastics Club in Lower Hillmorton Road. 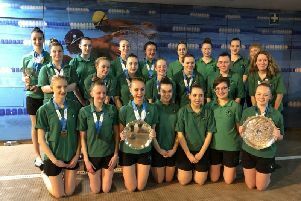 Rugby gymnasts competed in the Midlands Regional Women’s championships last month in Cannock Staffordshire, one of their most important events on their competition calendar. Competing were Erin McAulley, 9, Amelia Hawker, 8, Isabel Turnbull, 8, Francesca James, 8 and Abigail Timms 8. Abigail was placed in bronze medal position with a score of 49.380 across four pieces of apparatus, vault, bars, beam and floor. Erin McCaulley was sixth overall in the ‘out of age’ category. All the girls are coached by Tracey Kerr and Clare Clewlow and train between 10 and 15 hours a week at the Lower Hillmorton Road club. Rugby Gymnastics Club are currently looking to relocate to new premises - and already have planning permission to build a new gym at Kilsby Lane for their 1,000 members - but desperately need to raise the final funds for the project. If you are able to help them please go to their Just Giving page www.justgiving.com/campaign/Rugbygymnasticsnewbuild or call Development Director Gill McKee on (01788) 542617.